Moscow Museum of Russian Art: History, Acquisitions, Collection Highlights, Masterpieces. One of the best art museums in the world, the State Tretyakov Gallery in Moscow holds the national collection of Russian art. Founded originally in 1874 by Pavel Tretyakov (1832-1898), one of the great Russian art collectors, it is now located in Zamoskvorechye, one of the oldest districts of Moscow, not far from the Kremlin. The permanent collection of the Tretyakov Gallery amounts to more than 150,000 paintings, sculptures and graphics, and consists exclusively of works by Russian artists, although it embraces painters and sculptors - eg. from Ukraine, Belorussia, Armenia and elsewhere - who are closely associated with the history and development of art in Russia. It includes masterpieces by nearly all Russia's greatest painters. In 2006 the Tretyakov Gallery celebrated its 150th anniversary as a national museum of Russian art. 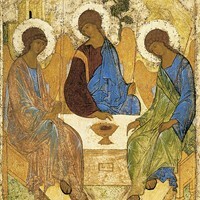 Icon painting by Andrei Rublev. and How to Appreciate Paintings. The museum actually consists of several different buildings: (1) The Tretyakov Gallery at 10 Lavrushinsky Lane. This displays Russian medieval painting, - notably a number of masterpieces from the Novgorod school of icon painting as well as examples from the later Moscow school of painting and also 18th century Petrine art, plus drawing and sculpture from 1200 to 1900. (2) The Tretyakov Gallery at 10 Krymsky Val. This displays 20th century Russian art and contemporary art forms like installations. Other departments of the museum include: (3) The "Engineering Wing" at 12 Lavrushinsky Lane, which hosts temporary shows. (4) The Exhibition Hall at 6 Maly Tolmachevsky Lane, (building 1). (5) The Museum Church of St Nicholas in Bolshoy Tolmachevsky Lane. (6) The Memorial Studio of the Sculptor Anna Golubkina. (7) The Memorial Flat of Apollinary Vasnetsov. (8) The House-Museum of Pavel Korin. (9) The House-Museum of Victor Vasnetsov. Top Art Museums in Europe. The collection spans almost nine centuries of Russian art, from Byzantine frescoes and panel paintings, the earliest icon-painting from Vladimir-Suzdal, Yaroslavl, Pskov, Novgorod and Moscow - contemporary with Theophanes the Greek (c.1340-1410), Andrei Rublev (c.1360-1430), Dionysius (c.1440-1502) and Simon Ushakov (1626-86) - through the 16th/17th century non-religious portraiture (parsunas), to the great 19th century Russian realists. Early Russian portraitists in the Tretyakov collection include: Ivan Nikitin (1688-1742), Ivan Vishnyakov (1699-1761), Andrei Maveyev (1701-39), Alexei Antropov (1716-95), Ivan Argunov (1727-1802), the Russian Gainsborough Vladimir Borovikovsky (1757-1825) and the court painter Fyodor Rokotov (1735-1808). A good example is the Portrait of Ursula Mniszech (1782) by Dmitri Levitsky (1735-1822). See: Russian Painting, Eighteenth Century. The Tretyakov collection incudes genre-paintings such as The Lacemaker (1823) by Vasily Tropinin (1776-1857), portraiture by artists like Alexei Venetsianov (1780-1847), Orest Kiprensky (1782-1836) and the Italian-trained Karl Briullov (1799-1852). Nineteenth century Russian history Painting is represented by Fyodor Bruni (1799-1875) and Vasily Timm (1820-95), while religious painting is exemplified by The Appearance of Christ to the People (1837-57) by Alexander Ivanov (1806-58), a huge composition which took 20 years to complete. Meanwhile, Russian landscape art of the 19th century is represented by artists such as Alexei Venetsianov, Nikifor Krylov (1802-31) and Grigory Soroka (1823-64), while still life painting is exemplified by Ivan Khrutsky (1810-85), Kapiton Zelentsov (1790-1845), and Alexei Tyranov (1808-59). The Tretyakov holds a large number of works by the late 19th century Wanderers or Itinerant Painters, including: the genius portraitist and genre-painter Ivan Kramskoy (18371887), Vasily Perov (18341882), Ilya Repin (1844-1930), Vasily Surikov (1848-1916), Nikolai Gay (18311894), Grigory Miasoyedov (18341911), Ivan Shishkin (1832-98), and Isaac Levitan (1860-1900). Masterpieces include: Repin's Religious Procession in Kursk Province (1883) and Tsar Ivan the Terrible and his Son on 16 November 1581 (1885), Surikov's The Morning of the Execution of the Streltsy (1881) and Levitan's Secluded Monastery (1890). Itinerant genre-painters represented include Vasily Pukirev (1832-90), Vasily Maximov (1844-1911), Konstantin Savitsky (1844-1905) and Sergei Ivanov (1864-1910). See for example Savitsky's Repairing the Railway (1874), and Ivanov's evocative On the Road: The Death of a Migrant Peasant (1889). The Itinerant Painter and World of Art member Valentin Serov (1865-1911) was a brilliant Impressionist artist - see his genre work Girl with Peaches (1887), Portrait of Isaac Levitan (1893) and the icy landscape Colts at a Watering Place, Domotkanovo (1904). Other Impressionist-style masterpieces featured at the Tretyakov Gallery include The Seated Demon (1890) and Portrait of Konstantin Artsybushev (1897) by Mikhail Vrubel (18561910), and Chorus Girl (1883) by Konstantin Korovin (1861-1939). Another masterpiece is Portrait of Zinaida Hippius (1906) by Leon Bakst (18661924). Other great landscape pictures at the Tretyakov include: Constantinople Street: Midday (1910) by Martiros Saryan (1880-1972), and Domes and Swallows (1921) by the Union of Russian Artists painter Konstantin Yuon (1875-1958). The Tretyakov collection also features a wide range of modern art. Highlights include: Kochel (1902), Boat Trip (1910) and Composition VII (1914) among others by Wassily Kandinsky (1866-1944); View from the Window, Vitebsk (1914) by Marc Chagall (18871985). Periods/movements represented include: Rayonism (works by Larionov, Goncharova), Suprematism (founded by Kasimir Malevich) and Constructivism (Vladimir Yevgrafovich Tatlin, Alexander Rodchenko, Lyubov Popova, El Lissitzky and others), and Socialist Realism (Arkady Plastov, Alexander Gerasimov, and sculptors like Sergei Merkurov and Vera Mukhina). Displays include the reconstruction of the well-known exhibition of "OBMOHU" (Association of young artists) of 1921. Exhibits also include contemporary art forms like installations, photographs, and conceptual art. A final section displays Russian art from the middle of the 1950s to the late 1990s, dealing with the history of Russian art from the "Thaw" to present day. By 1872, he had amassed over 150 paintings which were rapidly outgrowing the family's house in Tolmachy. Accordingly a special Gallery adjoining the south wall of the house was built to hold the collection. The two-storey structure was opened in March 1874. Three further extensions were constructed: in 1882, 1885 and 1892. During all this time, Pavel Tretyakov also found time to help the Moscow Art Lovers Society, the Moscow Art Society, and the Moscow School of Painting, Sculpture and Architecture. In addition, he contributed significantly to the establishment of the University Museum of Antique Art in Moscow, which provided the foundation for the Museum of Fine Arts. Plaster casts of Classical sculptures kept in Rome, were made with Tretyakov's financial support. He was also a close follower of developments in the Russian art world, such as the foundation of the Society for Itinerant Art Exhibitions by progressive students of the Imperial Academy of Arts, in 1863; the World of Art, founded in 1898 by a group of artists and writers including Alexander Benois, Leon Bakst, and Sergei Diaghilev; and the Union of Russian Artists. In August 1892, following the death of his brother Sergei M. Tretyakov - who had bequeathed him his personal art collection - Tretyakov donated his entire holding to the City of Moscow. The brothers' joint collection (worth about 1.5 million roubles) consisted of 1,280 paintings, 520 drawings, and 9 sculptures by Russian artists; plus 75 paintings and 8 drawings by foreign masters. Pavel Tretyakov died on the 27th of December 1898. In the decade following his death, the collection was augmented by many other works, including the collection amassed by Mikhail Morozov, brother of the great collector Ivan Morozov. After the Bolshevik takeover, the museum was renamed the State Tretyakov Gallery. 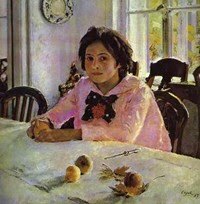 By 1918 it had become the most prominent collection of Russian art in the country. Surviving the early 1920s under the Soviet Institute of Artistic Culture INKHUK (Institut Khudozhestvennoi Kulturi), and the Great Patriotic War 1941-45, the Gallery has seen its permanent collection grow to over 150,000 exhibits, making it the greatest single collection of Russian art in the country. The State Tretyakov Gallery in Lavrushinsky Lane and Krymsky Val and the Engineering Wing are open every day 10.00-19.30 hours. The Gallery is closed on Monday.  For more information about the world's greatest art museums, see: Homepage.